Homemade bread and the Panasonic bread maker. I love waking up to the smell of homemade bread. 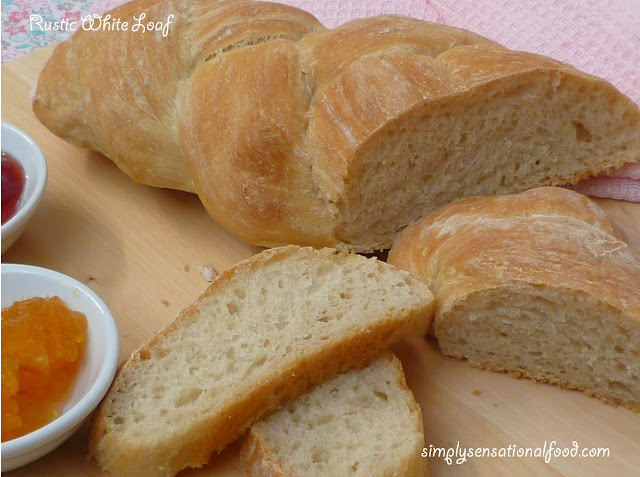 There is nothing better than the aroma of fresh bread wafting from the kitchen. It helps to wake the grumpiest person in our household with a smile. Making bread can be a laborious task and it needs a lot of time and patience. To make bread from scratch, a lot of stages are required such as mixing, kneading, proving, kneading again and proving again before the final bake. Although it can be therapeutic, one needs a lot of spare time before you can savour the freshly baked bread. If like me you too enjoy fresh homemade bread but don't really have the time to bake it, what you need is a bread maker. There are many bread makers available to buy on the market, but I particularly like the Panasonic range. The bread makers are simple and easy to use with many integrated features such as a temperature sensor that adjusts programmes processes according to the surrounding temperature. They have 33 programmes, a nut and raisin dispenser that evenly distributes fruit and nut throughout the bread. The added facility of a digital timer that can be preset up to 13 hours is really excellent as it enables you to programme the bread maker the night before so that you can wake up to a fresh loaf of bread. Included with the bread maker are accessories that help you create and measure the ingredients correctly. 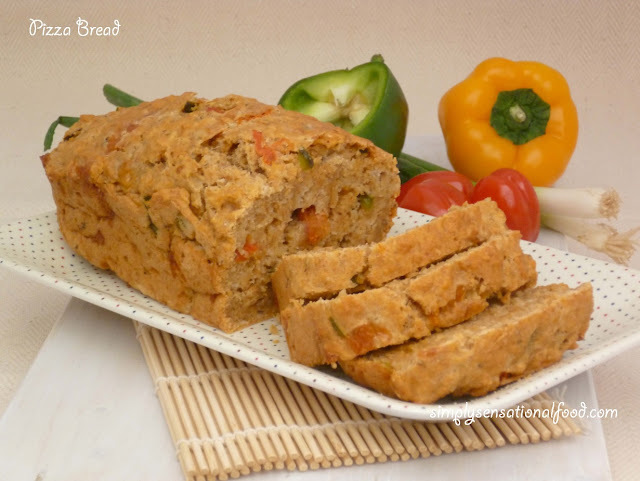 The variety of programs can create a basic loaf or you can make speciality breads without too much complications. The bread makers come in 6 different models and there is a choice of colours; black, white or chrome, making them suitable for any style of kitchen. 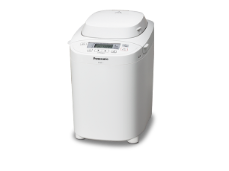 The Panasonic bread makers start from £89 and range upwards depending on the facilities each model offers. If you enjoy baking bread, investing in a breadmaker would save you a lot of time and give you a lot of pleasure in creating different varieties of homemade breads. This is a collaborative post, all views and opinions expressed in this post are unbiased and my own. Fresh fruits and vegetables make up almost 75 % of my weekly shopping. 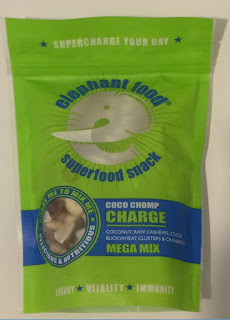 We consume a lot of fruits and vegetables and to save money I always buy in large packs or in bulk. This sounds like a great idea but there are times this also means that there is waste. Often we can't always use up all the produce we buy and it starts to rot and we end up throwing it away. I check my fridge daily to avoid unnecessary wastage and any odd vegetables, tomatoes or small amounts of leafy veg that are left over I wash cut and chop into bite size pieces. I either use them for stews and soups on the day or freeze them for later. Any overripe fruits I also chop up and use in smoothies, sorbets or freeze to use them later in smoothies. I find that fruits and veggies tend to rot in the fridge because they produce a gas called ethylene. If the veg compartment is over filled and over packed or the fruit is left in plastic bags, the condensation formed inside rots the vegetables. 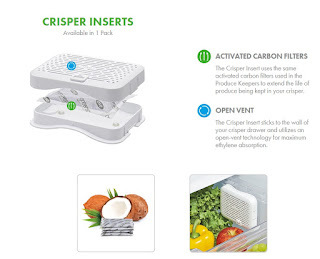 This was a major problem in my fridge that is until I discovered the OXO Produce green savers. 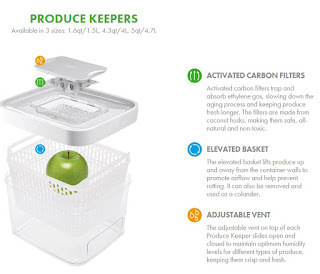 Oxo produce green savers are the perfect storage solution as they have elevated baskets, adjustable vents and carbon filters in the lids. These maintain the perfect storage environment for the produce keeping it fresher for longer. 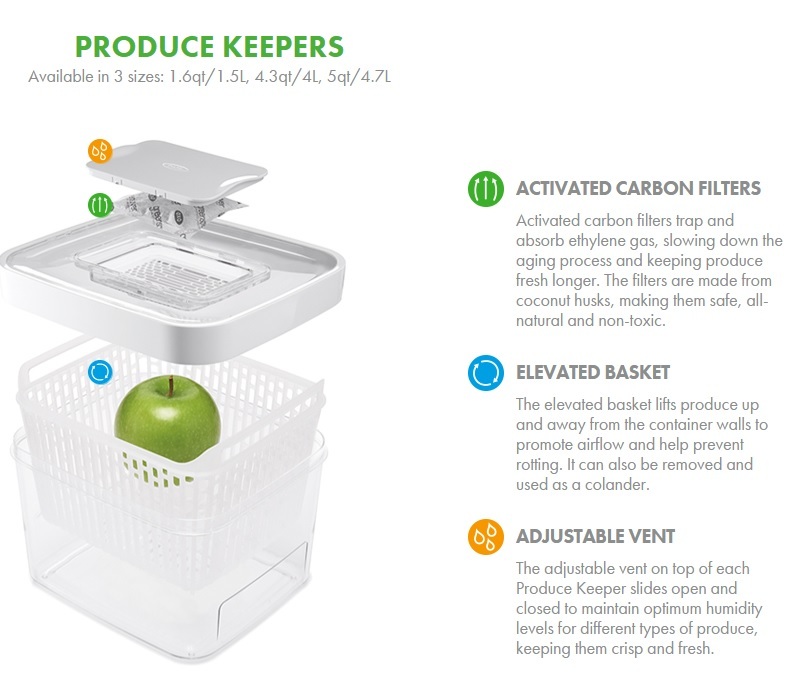 Elevated basket promotes airflow to prevent rotting, features handles for easy removal and can be used as a colander. Comes in three sizes 1.5L, 4.0 L, and 4.7L. Convenient Chart or usage guidance included underneath the vent. Available in three stackable modular sizes, the Green Saver small size, 1.5l is ideal for berries and the medium size 4l is ideal for lettuce, green bean, broccoli and grapes. The largest size 4.7l easily accommodates longer produce such as carrots, cucumbers and celery. 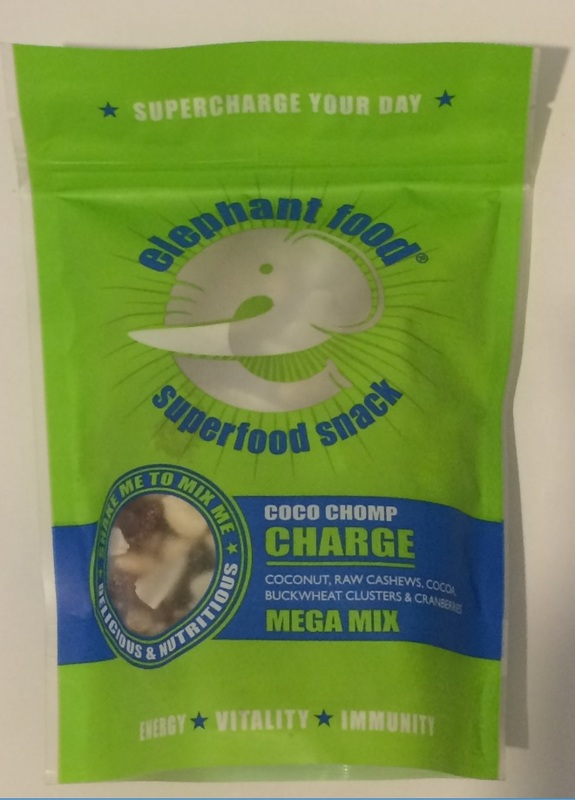 I love my Oxo Green savers that OXO sent me to review. They have made my produce storage solution easy. As always whenever I try out a new product I always want my readers to have the opportunity to do the same. 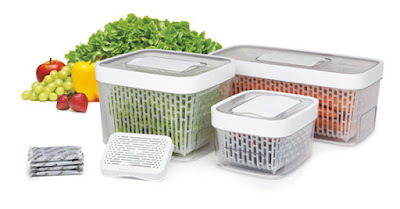 OXO has been very kind and they have agreed to giveaway two of their Green saver 15 L to one lucky simplyfood reader. This competition is open to UK residents only over the age of 18 .Please read the rules below. Leaving a blog comment is mandatory and failure to do so will void any other entries. 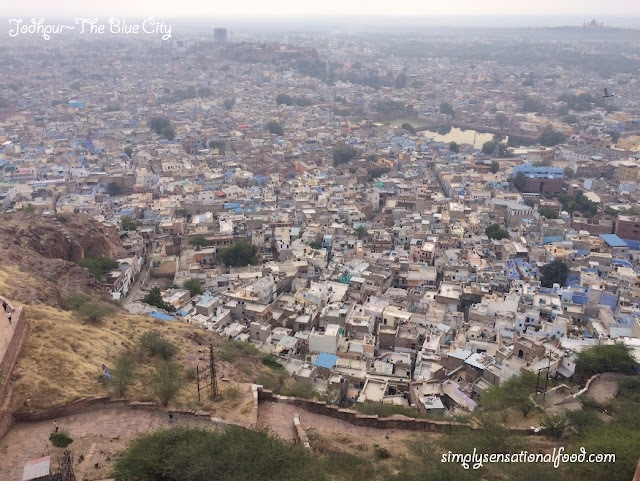 You will need to complete the mandatory entry first – usually making a blog comment. You can do this by clicking on leave a comment at the bottom of the post and leaving your reply in the comment box.Please note your comment will not show immediately as it needs to be moderated however rest assured it will appear on the site, so carry on with rest of entries. A delicious creamy aromatic gingerbread latte with aromatic spices. 1. 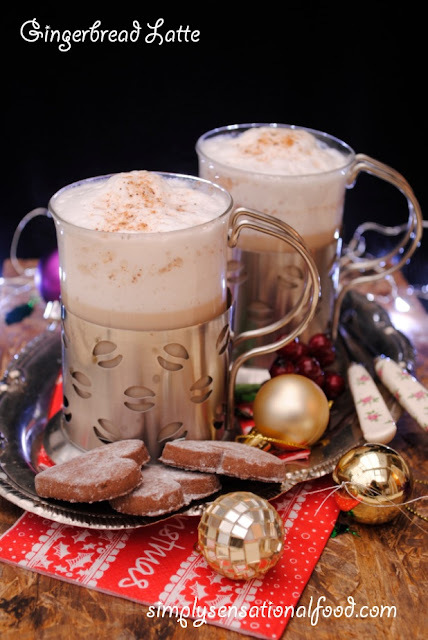 In a saucepan add the milk, sugar, ginger paste,1 teaspoon nutmeg, cinnamon and bring the milk to boil. 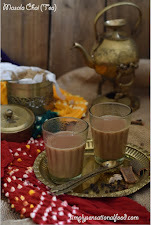 Once it's boiled remove the milk from heat and strain it into a glass jug.2. Using an electric whisk or milk frother froth the milk.3. In two tall latte glasses, divide the espresso coffee equally.4. 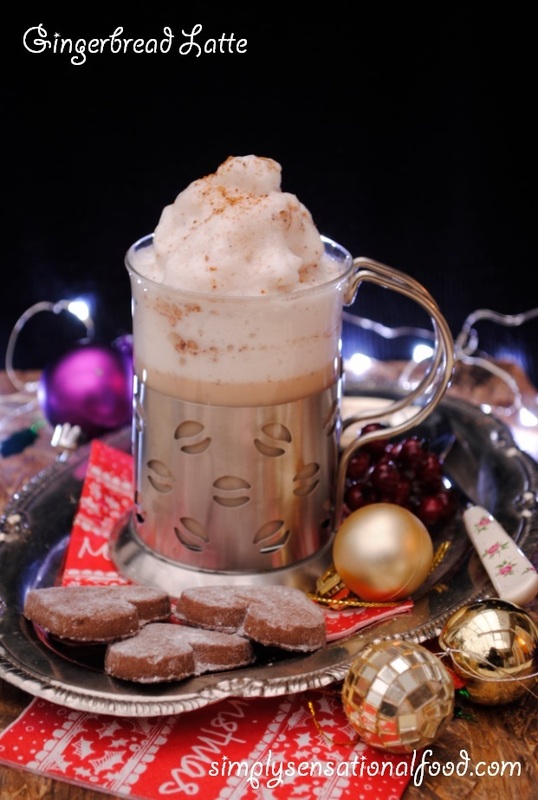 Top the espresso with hot milk and spoon the froth over the coffee. Sprinkle with the remaining nutmeg and serve immediately. During the months of November and December, I have had a lot of foodie gifts either sent to e by companies or gifted to me by friends and family. I love the whole collection of these delicious healthy goodies. 1. 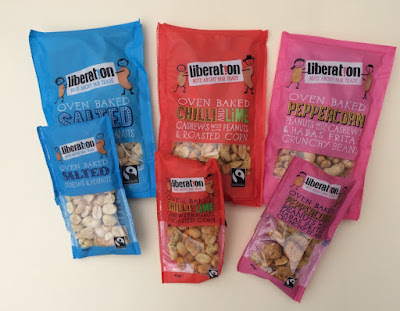 Liberation Nuts- these selection of nuts are perfect for nibbles, party nibbles and snacking. 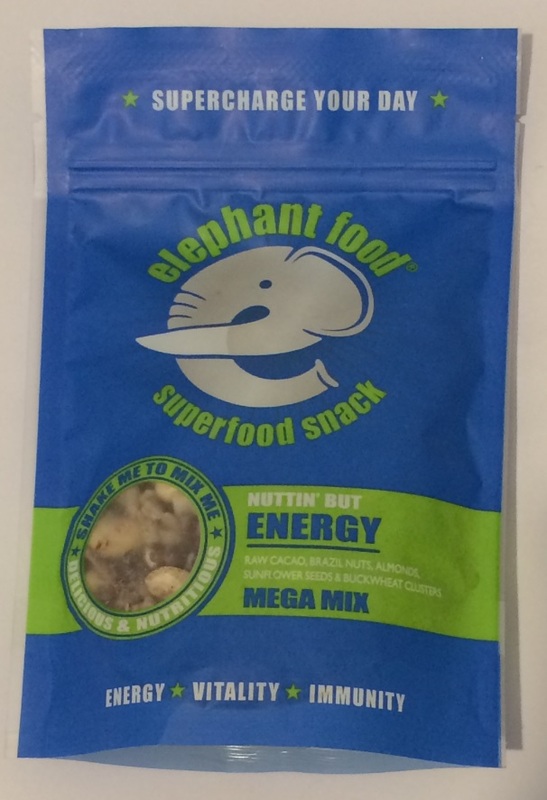 Three delicious varieties making these perfect for all tasted.They come in small single serving packs or larger packs for sharing. Oven baked Salted cashew and peanuts. 2. 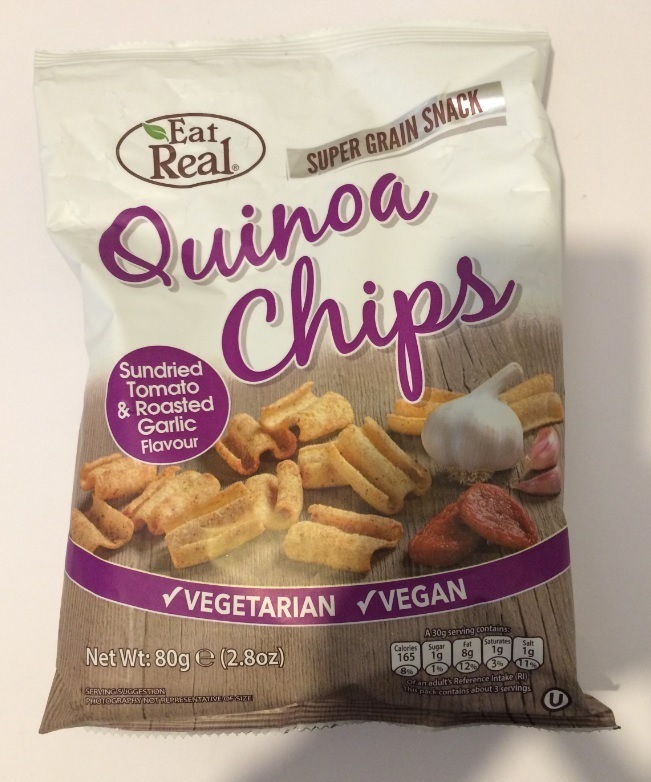 Quinoa Chips made by Eat Real, a super grain vegetarian and vegan snack that is delicious and healthy. These come is assorted flavours and are so moreish. 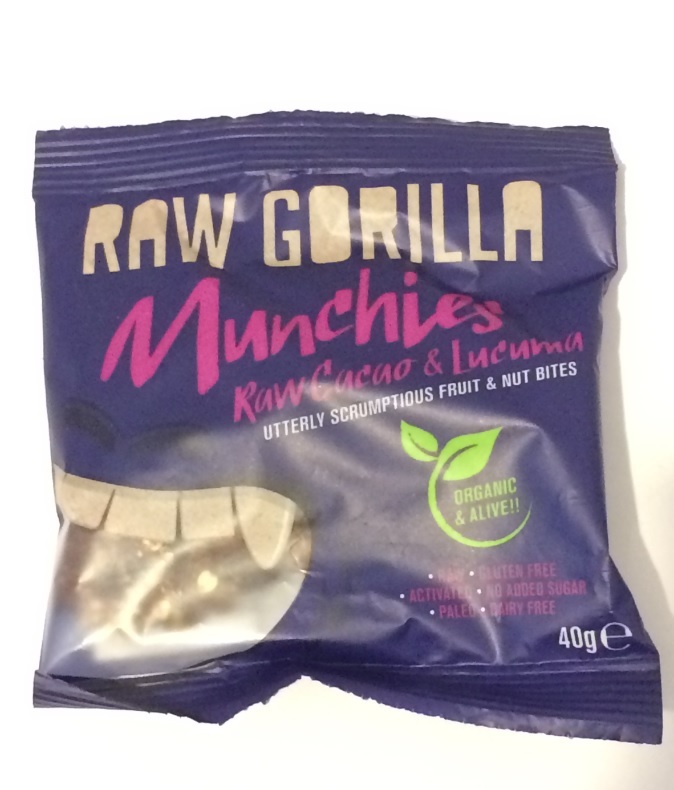 3.Raw Gorilla Munchies- Grain free cereal free snacks. Raw Cacao and Lucuma fruit and nut bites. 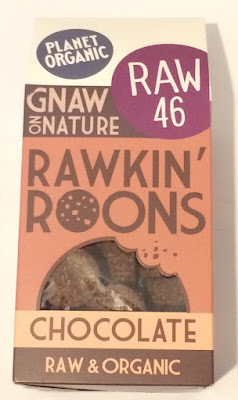 5.Planet Organic Gnaw on Nature Raw 46- mini bite size snacks made with natural goodness. 6. 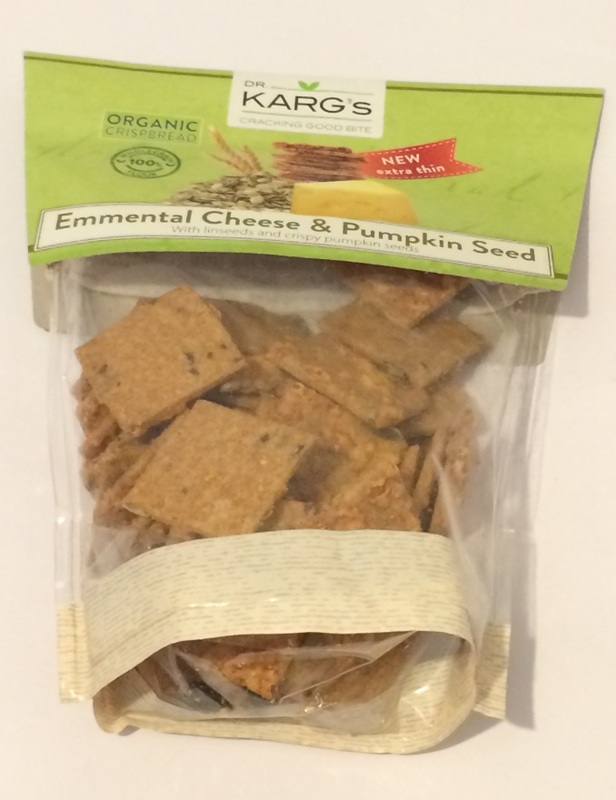 Dr.Karg's Organic crispbread Emmental Cheese and pumpkin seed crackers. these delicious and healthy bites a have pumpkin seeds and linseeds and are made with 100 % wholegrain flour. After the indulgence of food during of the festive period, these delicious snacks are perfect if you want to have a guilt free snack for the new year.I was sent the liberation nuts to review all other products were bought for me by friends and family. 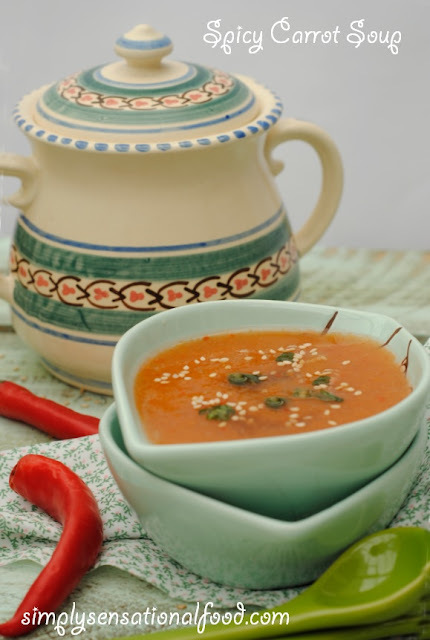 Indo Chinese flavours in this carrot soup makes this perfect for a winter warmer starter soup. 1. Peel and dice the carrots and potatoes.2.Add the carrots, potatoes, water, garlic, lemon grass, salt, soya sauce and red chilli in the Thermocook and cook on the auto thick soup option.3. Once soup is cooked you can add boiling water to adjust the consistency of the soup to preference.4. 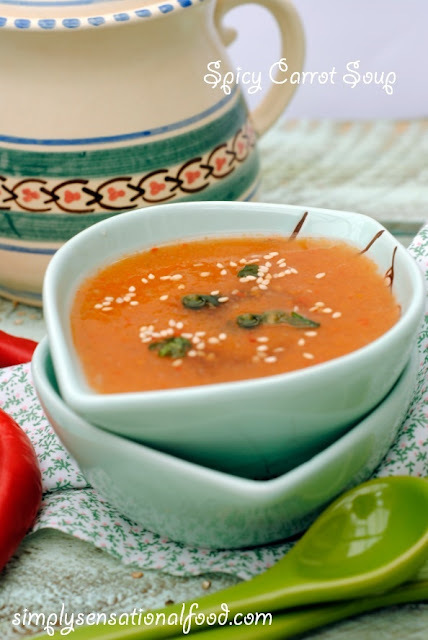 Serve soup in bowls garnished with chopped coriander leaves and a sprinkling of toasted sesame seeds. I cooked my soup in the ThermoCook which I have been trialling. I love the versatility of the ThermoCook. 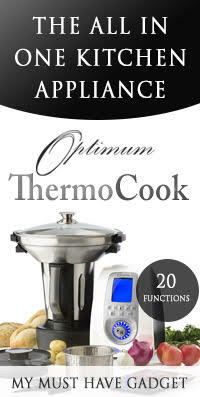 ThermoCook is a multi-function cooking appliance that has loads of functions. 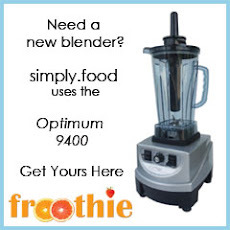 It consists of a large 2 litre stainless steel power blender that blends as well as cooks and steams. It has over 20 functions that include stirring, steaming, kneading, cooking, blending chopping, whipping, mixing, emulsifying and milling. The Optimum ThermoCook includes auto-programs that are pre-set to make Smoothie, Quick Soup, Thick Soup, Chop, Sauté, Stir, Steam, Stew, Warm, Reheat, Boil, Yoghurt, Rice, Porridge, Kneading. You can also use the ThermoCook to create your own recipe and save the programme to come back to it again and again. Currently the ThermoCook is on special offer at £549.00, it may sound steep for a gadget but trust me it really does do everything it states and much more. You can actually prepare your whole meal using this one gadget.Think of all the washing up you will save. 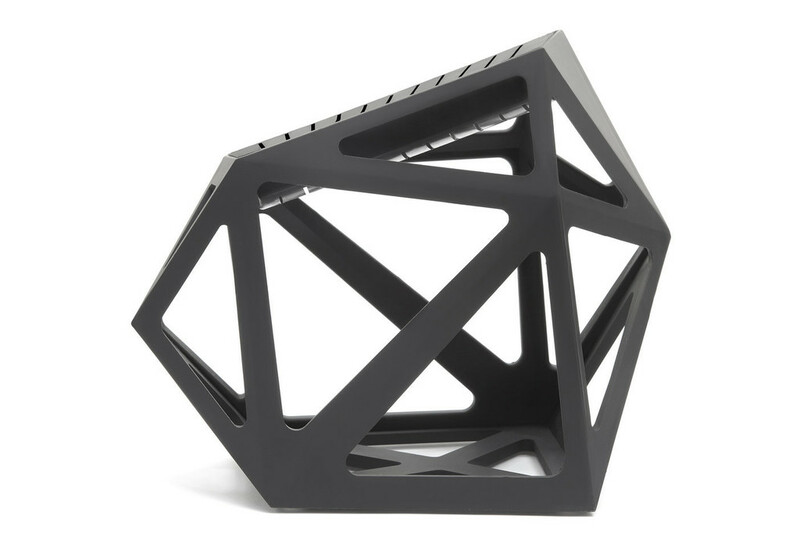 If you want to take advantage of this awesome gadget you can check it out here. 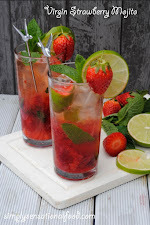 For more recipes using the ThermoCook do check some of these awesome recipes by my friends. 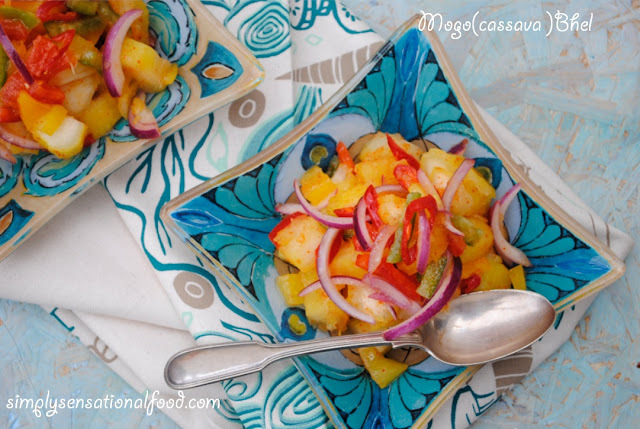 Mogo or better known as cassava or yucca is a very common vegetable eaten in South America, India and also African countries. In East Africa cassava is a staple just like potatoes are in the west. 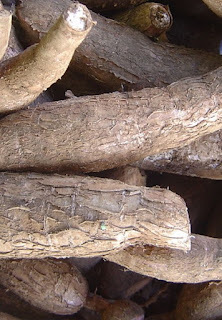 Cassava root is long and tapered, the vegetable has a thick outer brown skin and a white flesh. The tough outer skin/ rind has to be peeled before cooking. It can be eaten boiled, fried, mashed or dried made into flour too. It is also known as Tapioca. 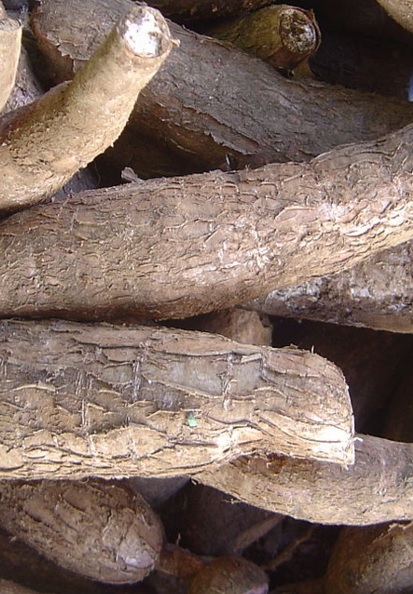 Cassava roots are high in starch and contain lots of calcium.It is high in vitamin c , folic acid and potassium. Bhel is an indian name given to a street food type cold salad / snacks made with any vegetables such as potatoes, chickpeas, corn and is garnished with onions tomatoes, crunchy puffed rice and served with a dressing called chutney. We eat cassava a lot in our household, the easiest and tastiest way to cook it is to boil it and eat it as a warm side salad or snack.I am sharing here my simple yet yummy Cassava Bhel recipe cooked in my new ThermoCook. You can boil the cassava on the stovetop in a normal way too. African style mogo, spicy, tangy and garnished with red onion, green and red peppers and coriander leaves. 1. Place the frozen cassava chips in the thermocook and add 150 ml water.Add 1 teaspoon salt and the turmeric powder and cook on boil function for 25 minutes or until cassava is fully cooked and soft.2. Cut the red onion in half and slice it into thin slices.3. Dice the peppers into small pieces.4. Slice the red chilli into thin round slices.5. Chop the coriander finely.6. Once the cassava is cooked remove from the thermocook and discard any water.7. Pat the cassava dry with kitchen paper and cut it into 1cm diced pieces. 8. 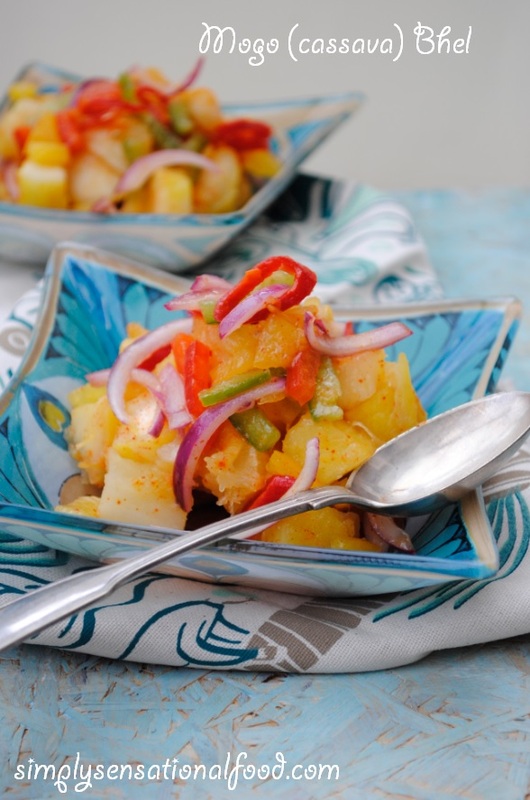 In a large bowl put the chopped cassava, sliced onions, diced peppers, lemon juice, remaining 1/2 teaspoon salt, chilli powder, red chillies, olive oil and chopped coriander and toss together. 9. Transfer to serving plates and serve warm or cold. I cooked my cassava in the ThermoCook which I have been trialling. I love the versatility of the ThermoCook. In my kitchen I have a vast collection of cookbooks. 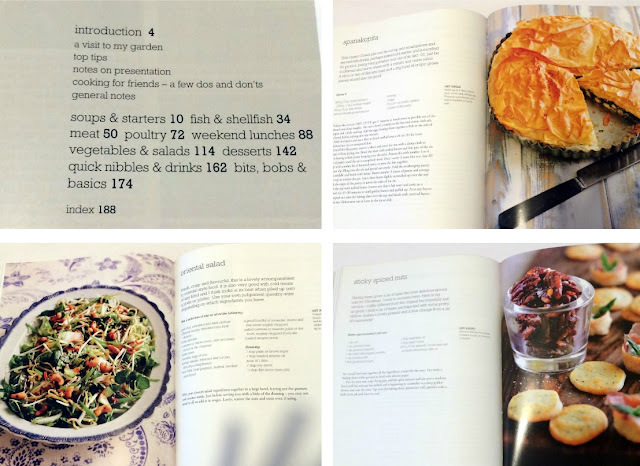 I know nowadays you can get recipes on line but there is nothing nicer than browsing through cookbooks, looking at the glossy photos and flicking through the pages. Make it Easy cookbook by Jane Lovett is a lovely cookbook with 100 pages. It has a selection of foolproof, stylish and delicious go ahead recipes ranging from soups and starters, fish, meat, lunches and desserts. 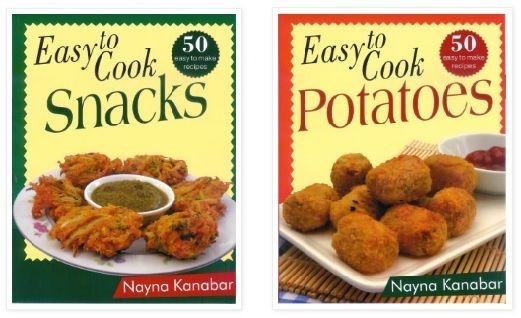 All the recipes are simple and easy to follow so the book is suitable for an amateur or an expert cook. I have tried a few recipes from the book such as Spanakopita a a spinach and feta tart, Oriental salad and the sticky spiced nuts. They turned out delicious. All the views and opinions expressed in this post are my own. I would like to thank Lifestyle books for sending me this book to review.They have also been very generous and agreed to provide an additional copy for one simplyfood reader. If you are a foodie like me I am sure you are all aware that the first and foremost kitchen tool in any kitchen is a good set of knives. Without good knives the food you cut will be damaged ,bruised and the above all it's very dangerous to use blunt and damaged knives. I have an assortment of knives in my kitchen, however I do find that a lot of them are blunt or the blades and pointsare bent or damaged, so it was time to replace them with some good quality knives. 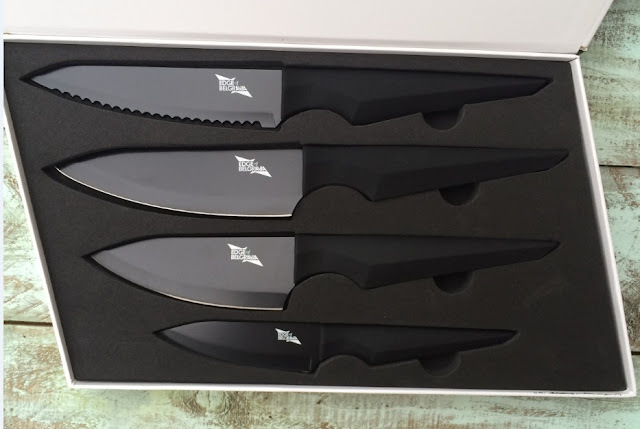 The Black Diamond kitchen knives made by Edge of Belgravia are an absolute must in any kitchen. 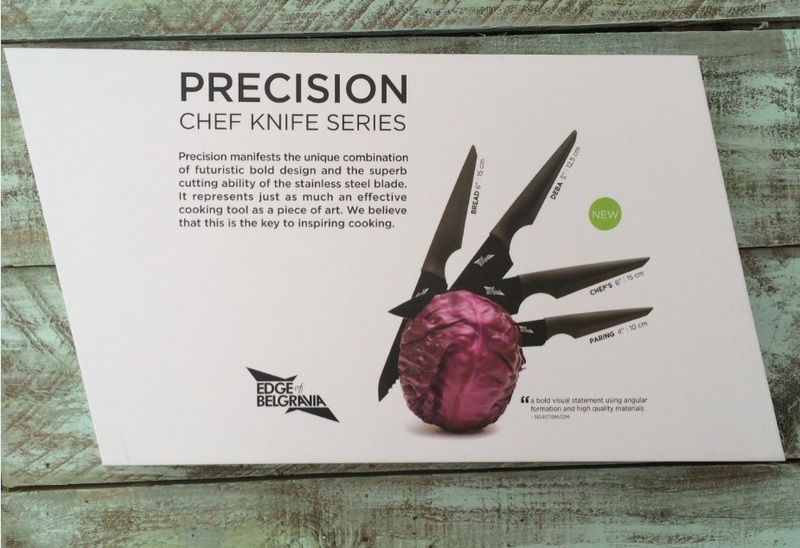 These precision knives are designed by Christian Bird. They are made from from stainless steel with a non stick coating and they have a futuristic bold design which is very eye catching and stylish. 15 cm BREAD knife- A nimble knife with a serrated blade that is perfect for slicing crusty bread, fresh bread without squashing it. 12.5 cm DEBA knife - A Japanese style knife perfect for sushi, steak, fish, fruit and veg. 15 cm CHEF'S knife- The perfect knife for cutting and slicing. 10 cm PARING knife - The one knife that you must have for smaller tasks and small chopping, peeling, cutting. 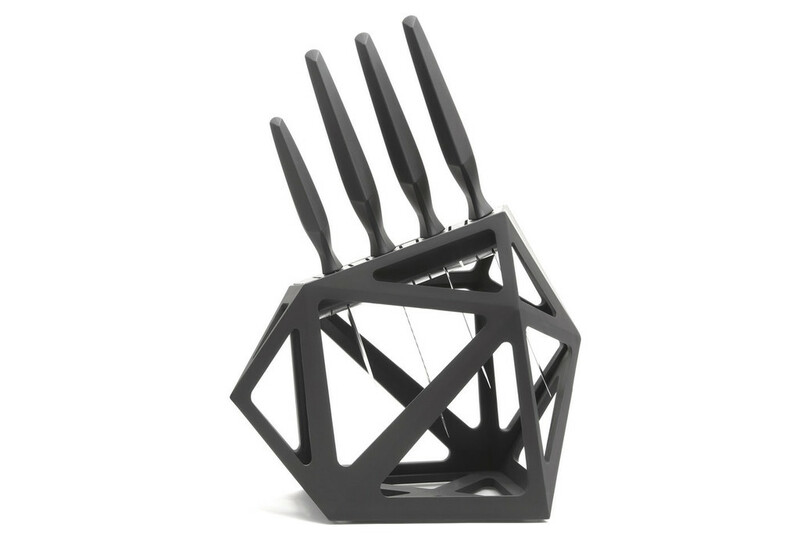 The four knives can be stored in a beautiful black diamond shaped block, which will look great on any kitchen top. This competition is open to UK residents only .Please read the rules below . 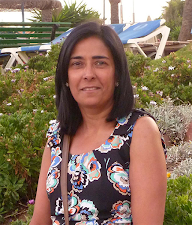 · You will need to complete the mandatory entry first – usually making a blog comment. You can do this by clicking on leave a comment at the bottom of the post and leaving your reply in the comment box.Please note your comment will not show immediately as it needs to be moderated however rest assured it will appear on the site, so carry on with rest of entries. · Login to Rafflecopter – click to see what the question is. Make a comment answering the question on the blog. · Go back to Rafflecopter and click the green button to tell me you have made a comment, this will unlock all the other options. All entries are checked to see that the mandatory question is answered, if its not all bonus entries will become void. · Rafflecopter will tweet, like and follow on your behalf. · For information on how to find the URL of your tweet click here. · For bonus entries you can return to this page and enter the daily bonus entries. · If you are still unsure as to how Rafflecopter works please do check out this short video.